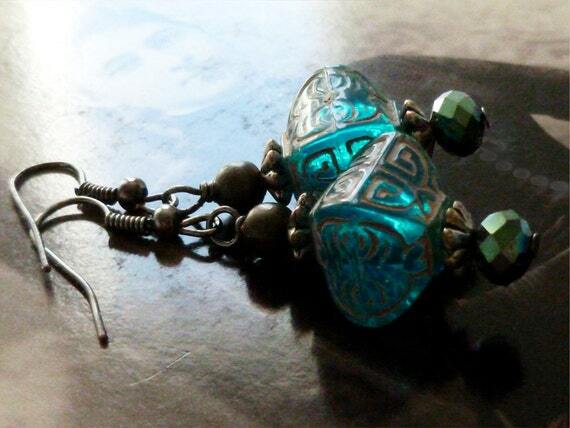 Handmade jewelry in a gypsy, boho, tribal, whimsical style. Oh, how the light shines through the Asian-style blue beads on these earrings, making them look like little Oriental lanterns! Created with a mix of old and new materials, these lightweight earrings are fun to wear and lovely to look at. Click the image above to see if item is still available or to place a custom request. Visit GypsyInMyBlood.Etsy.com to see all my jewelry! All my jewelry is for adults and children over age 14. ©2013-2014 GypsyInMyBlood. Powered by Blogger.